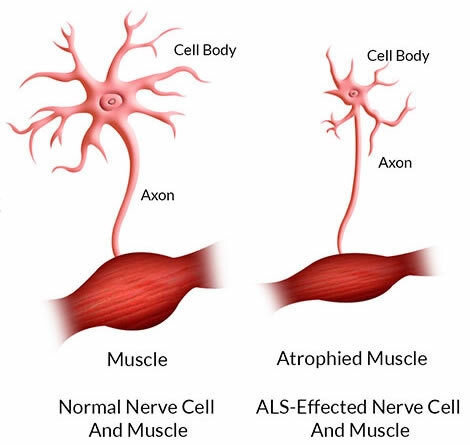 Lou Gehrig’s disease, or amyotrophic lateral sclerosis (ALS), is a neurodegenerative disease of unknown cause that breaks down tissues in the nervous system and affects the nerves responsible for movement. Its common name comes from the professional baseball player whose career was ended because of it. 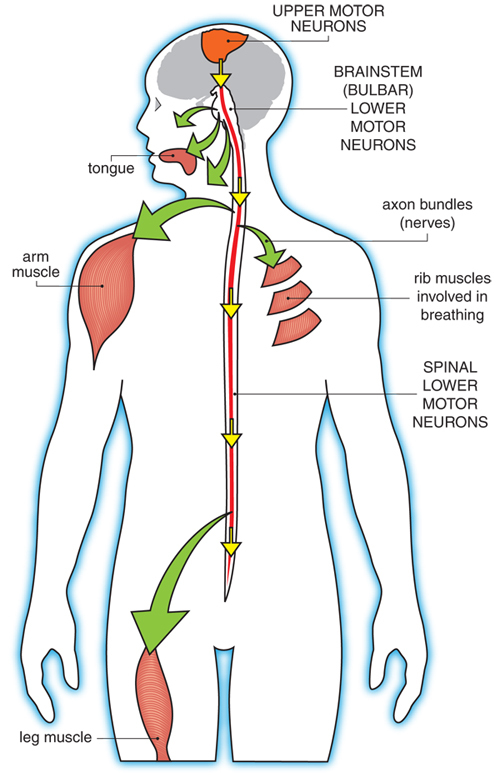 Lou Gehrig’s disease is a disease of the motor neurons, those nerve cells reaching from the brain to the spinal cord (upper motor neurons) and the spinal cord to the peripheral nerves (lower motor neurons) that control muscle movement. In Lou Gehrig’s disease, for unknown reasons, these neurons die, leading to a progressive loss of the ability to move virtually any of the muscles in the body. The disease affects “voluntary” muscles, those controlled by conscious thought, such as the arm, leg, and trunk muscles. Lou Gehrig’s disease, in and of itself, does not affect sensation, thought processes, the heart muscle, or the “smooth” muscle of the digestive system, bladder, and other internal organs. Most sufferers retain function of their eye muscles, as well. “Amyotrophic” refers to the loss of muscle bulk, a cardinal sign of ALS. “Lateral” indicates one of the regions of the spinal cord affected, and “sclerosis” describes the hardened tissue that develops in place of healthy nerves. Lou Gehrig’s disease affects approximately 50,000 people in the United States, with about 5,000 new cases each year. The onset usually begins between the ages of 40 and 70, although younger onset is possible. Men have a slightly higher chance of developing the disease than women. The symptoms of Lou Gehrig’s disease are caused by the death of motor neurons in the spinal cord and brain. Normally, these neurons convey electrical messages from the brain to the muscles to stimulate movement in the arms, legs, trunk, neck, and head. As motor neurons die, the muscles cannot be moved as effectively, and weakness results. In addition, lack of stimulation leads to muscle wasting, or loss of bulk. Involvement of the upper motor neurons causes spasms and increased tone in the limbs, and abnormal reflexes. Involvement of the lower motor neurons causes muscle wasting and twitching (fasciculations). Although many causes of motor neuron degeneration have been suggested for Lou Gehrig’s disease, none has yet been proven responsible. Results of recent research have implicated toxic molecular fragments known as free radicals. Some evidence suggests that a cascade of events leads to excess free radical production inside motor neurons, leading to their death. Why free radicals should be produced in excess amounts is unclear, as is whether this excess is the cause or the effect of other degenerative processes. Additional agents within this toxic cascade may include excessive levels of a neurotransmitter known as glutamate, which may overstimulate motor neurons, thereby increasing free-radical production, and a faulty detoxification enzyme known as SOD–1, for superoxide dismutase type 1. The actual pathway of destruction is not known, however, nor is the trigger for the rapid degeneration that marks Lou Gehrig’s disease. Further research may show that other pathways are involved, perhaps ones even more important than this one. Autoimmune factors or premature aging may play some role, as could viral agents or environmental toxins. Two major forms of ALS are known: familial and sporadic. Familial Lou Gehrig’s disease accounts for about 10% of all Lou Gehrig’s disease cases. As the name suggests, familial Lou Gehrig’s disease is believed to be caused by the inheritance of one or more faulty genes. About 15% of families with this type of Lou Gehrig’s disease have mutations in the gene for SOD–1. SOD–1 gene defects are dominant, meaning only one gene copy is needed to develop the disease. Therefore, a parent with the faulty gene has a 50% chance of passing the gene along to a child. Sporadic Lou Gehrig’s disease has no known cause. While many environmental toxins have been suggested as causes, to date no research has confirmed any of the candidates investigated, including aluminum and metal dental fillings. As research progresses, it is likely that many cases of sporadic Lou Gehrig’s disease will be shown to have a genetic basis, as well. A third type, called Western Pacific Lou Gehrig’s disease occurs in Guam and other Pacific islands. This form of the disease combines symptoms of both ALS and Parkinson’s disease. The earliest sign of Lou Gehrig’s disease is most often weakness in the arms or legs, at first usually more pronounced on one side than the other. Loss of function is usually more rapid in the legs among people with familial Lou Gehrig’s disease, and in the arms among those with sporadic Lou Gehrig’s disease. Less often, the earliest sign of Lou Gehrig’s disease is weakness in the bulbar muscles, those muscles in the mouth and throat that control chewing, swallowing, and speaking. A person with bulbar weakness may become hoarse or tired after speaking at length, or speech may become slurred. In addition to muscle weakness, the other cardinal signs of Lou Gehrig’s disease are muscle wasting and persistent twitching, which is known as fasciculation. These are usually noticed after weakness in muscles becomes obvious. Fasciculation is also common in people without the disease, and is virtually never the first sign of Lou Gehrig’s disease. While initial weakness may be limited to one region, Lou Gehrig’s disease almost always progresses rapidly to involve virtually all the voluntary muscle groups in the body. Later symptoms include loss of the ability to walk, to use the arms and hands, to speak clearly or at all, to swallow, and to hold the head up. Weakness of the respiratory muscles makes breathing and coughing difficult, and poor swallowing control increases the likelihood of inhalation of food or saliva (aspiration). Aspiration increases the likelihood of lung infection, which is often the cause of death. With a ventilator and scrupulous bronchial hygiene, a person with Lou Gehrig’s disease may live much longer than the average, although weakness and wasting will continue to erode any remaining functional abilities. Most people with Lou Gehrig’s disease continue to retain function of the extraocular muscles that control movement of the eyes, allowing some communication to take place with simple blinks or through use of a computer–assisted device. The diagnosis of Lou Gehrig’s disease begins with a complete medical history and physical exam, plus a neurological exam to determine the distribution and extent of weakness. An electrical test of muscle function, called an electromyogram, or EMG, is an important part of the diagnostic process. Various other tests, including blood and urine tests, x rays, and CT scans, may be done to rule out other possible causes of the symptoms, such as tumors of the skull base or high cervical spinal cord, thyroid disease, spinal arthritis, lead poisoning, or severe vitamin deficiency. Lou Gehrig’s disease is rarely misdiagnosed following a careful review of all these factors. There is no cure for Lou Gehrig’s disease, and no treatment that can significantly alter its course. There are many things that can be done, however, to help maintain quality of life and to retain functional ability even in the face of progressive weakness. Two studies published in 1988 suggested that amino–acid therapies may provide some improvement for some people with Lou Gehrig’s disease. While individual patient reports claim benefits for megavitamin therapy, herbal medicine, and removal of dental fillings, for instance, no evidence suggests that these offer any more than a brief psychological boost, often followed by a more severe letdown when it becomes apparent the disease has continued unabated. However, once the causes of Lou Gehrig’s disease are better understood, alternative therapies may be researched more intensively. For example, if damage by free radicals turns out to be the root of most of the symptoms, antioxidant vitamins and supplements may be used more routinely to slow the progression of Lou Gehrig’s disease. Or, if environmental toxins are implicated, alternative therapies with the goal of detoxifying the body may be of some use. In 2002, the Food and Drug Administration (FDA) granted approval for one company to begin trials on use of creatine, an amino acid dietary supplement, to treat ALS. Preliminary data from trials show that creatine might slow progression of Lou Gehrig’s disease, but research remains to be completed before approval of the supplement for treatment of ALS. A physical therapist works with the patient and family to implement exercise and stretching programs to maintain strength and range of motion, and to promote general health. Swimming may be a good choice for people with Lou Gehrig’s disease, as it provides a low–impact workout to most muscle groups. One result of chronic inactivity is contracture, or muscle shortening. Contractures limit a person’s range of motion, and are often painful. Regular stretching can prevent contracture. An occupational therapist can help design solutions for movement and coordination problems, and provide advice on adaptive devices and home modifications. Speech and swallowing difficulties can be minimized or delayed through training provided by a speech-language pathologist. This specialist can also provide advice on communication aids, including computer-assisted devices and simpler word boards. Nutritional advice can be provided by a nutritionist. A person with Lou Gehrig’s disease often needs softer foods to prevent jaw exhaustion or choking. Later in the disease, nutrition may be provided by a gastrostomy tube inserted into the stomach. As of early 2002, only one drug had been approved for treatment of Lou Gehrig’s disease. Riluzole (Rilutek) appears to provide on average a three-month increase in life expectancy when taken regularly early in the disease, and shows a significant slowing of the loss of muscle strength. Riluzole acts by decreasing glutamate release from nerve terminals. Experimental trials of nerve growth factor have not demonstrated any benefit. No other drug or vitamin currently available has been shown to have any effect on the course of Lou Gehrig’s disease. However, in 2002, researchers had identified how a common drug prescribed for acne could slow the progression of cell death in the brain that causes ALS. The drug, called minocycline, can safely be taken orally. Scientists are now working on a combination of minocycline with other drugs to better target a more powerful therapy for Lou Gehrig’s disease patients. Mechanical ventilation may be used when breathing becomes too difficult. Modern mechanical ventilators are small and portable, allowing a person with Lou Gehrig’s disease to maintain the maximum level of function and mobility. Ventilation may be administered through a mouth or nose piece, or through a tracheostomy tube. This tube is inserted through a small hole made in the windpipe. In addition to providing direct access to the airway, the tube also decreases aspiration. While many people with rapidly progressing Lou Gehrig’s disease choose not to use ventilators for lengthy periods, they are increasingly used to prolong life for a short time. The progressive nature of Lou Gehrig’s disease means that most patients will eventually require full-time nursing care. This care is often provided by a spouse or other family member. While the skills involved are not difficult to learn, the physical and emotional burden of care can be overwhelming. Caregivers need to recognize and provide for their own needs, as well as those of the patient, to prevent depression and burnout. Throughout the disease, a support group can provide important psychological aid to the patient, and also act as a caregiver as they come to terms with the losses that Lou Gehrig’s disease inflicts. Support groups are sponsored by both the Lou Gehrig’s Disease Society and the Muscular Dystrophy Association. Lou Gehrig’s disease usually progresses rapidly, and leads to death from respiratory infection within three to five years in most cases. The slowest disease progression is seen in those who are young and have their first symptoms in the limbs. About 10% of people with Lou Gehrig’s disease live longer than eight years. There is no known way to prevent Lou Gehrig’s disease or to alter its course.